Thanks to its composition including finely crushed white marble, this scrub eliminates impurities without causing irritation. Containing no chemical agents, it delivers gentle action to help stimulate cellular renewal. Perfectly suited to sensitive skin. Skin becomes immediately softer and more luminous. Apply a fine layer of Mild Scrub to cleansed and damp skin. For combination and oily skin, use daily. For other types of skin, use one to three times per week. Follow with your regular Karin Herzog care routine. 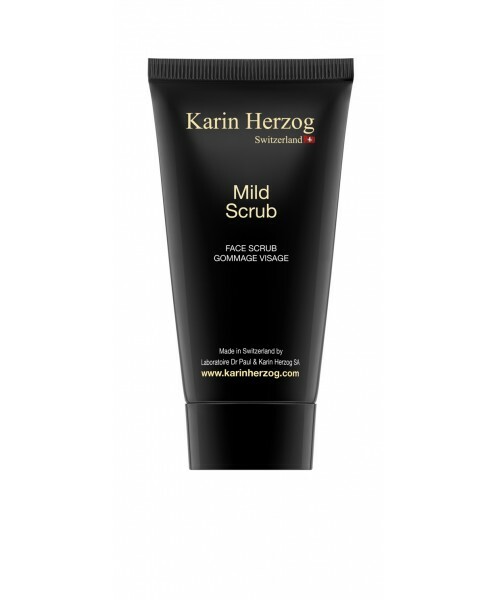 Mild Scrub can be combined with Professional Cleansing or Cleansing Milk for a deeper cleansing effect. Aqua, Calcium carbonate, Alcohol denat., Petrolatum, Paraffinum liquidum, Glyceryl stearate, Stearyl alcohol, Cetyl alcohol, Polysorbate 80, Methylisothiazolinone, Formic acid.